It seems as though we’ve wobbled back into Summer again after a week of misty, drizzly rain and endless fog which dissolved all my Summer vegetables into a slimy, gooey mess in just under a week….. But now, these last few days, and in this moment, it is warm, golden, sunny and still perfect beach and garden weather…..
What does one do and say with all this gracious light? You smile and say thank-you….. If the only prayer you said in your whole life was, “Thank you”, that would suffice. The success of this recipe is buying ripe avocados when in season and to be perfectly creamy in texture, when they are creamy in texture, they meld with the simplicity and subtleness of the rest of the ingredients. The second time I made this, I had an abundance of cucumbers in the garden which you see in the photos, but my favourite and preferred way of making this is with just the tomatoes as in the recipe above. Cut each avocado in half, remove the pit, and scoop out the flesh into a bowl. Add the lemon juice and salt. 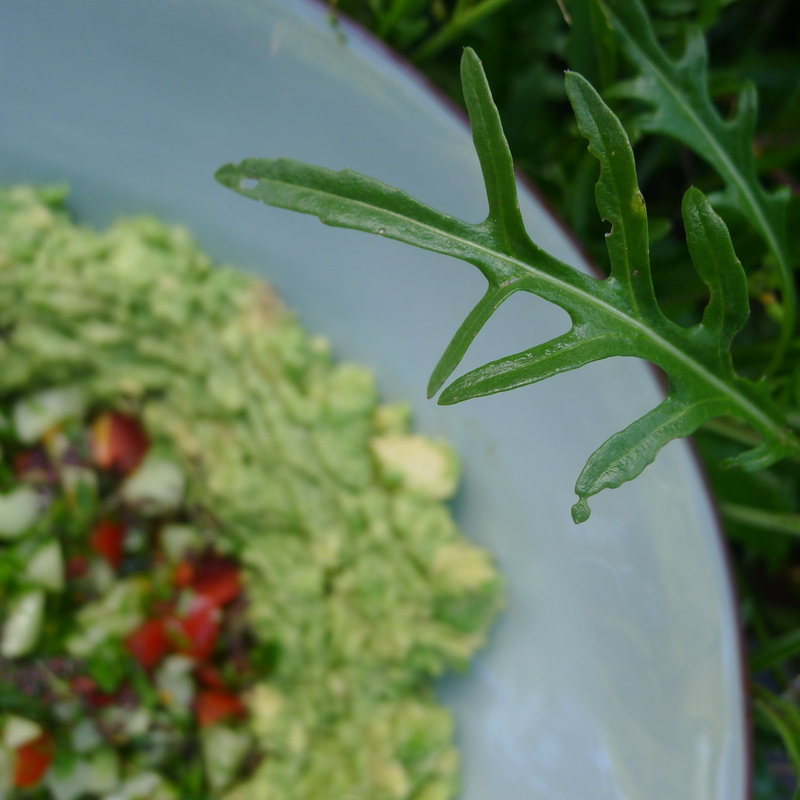 Mash the avocados a bit with a fork, or for big quantities, a potato masher works well. Don’t overdo it – you want the mixture to be quite chunky. Set aside. Chop the tomatoes into small pieces. Finely chop the fresh coriander and mint, then add to the tomatoes in a small bowl, combining until evenly mixed. Add salt and pepper to taste, and squeeze generously with lemon. Place the avocado mixture on a flat plate. Using a spoon, create a hole in the centre for the tomato salsa to sit in. Scoop the tomato salsa into the centre of the plate. Heat the oil/ghee in a small pan. When hot, add the mustard seeds and if using, the finely chopped chilli. When the mustard seeds start to sputter and pop, turn off the heat and pour over the tomato salsa. Sprinkle with the lemon zest. Find a sunny spot to sit and enjoy with these crackers or with slices of your favourite bread. Such a lovely avocado creation… It is piece of ART! It has created hunger in my being!! Surprisingly enough, we happen to have the “Butterfruit/Avocado” in season! It’s a different type of avocado, yet after a bit of salt & pepper, tomatoe, & cucumber, it makes for a delicious dish. I put that on his tasty! tasty bread which comes from your lovely Bread-Maker! I hope the afternoon heat does not take over the glorious coooool early mornings….! Please give my love to to Fishies! & Lior, Noa & Itmar I am forever grateful for the wonderful time we had with all of you in Portugal! This is my prayer for this moment in time…… I miss you daily presence in my life,….I take you with me every early a.m. up the backside of Chumundhi Hill, and this makes my heart happy, and creates a smile of positive energy allll over my face! Love, Love YOU! Namaste’ M.